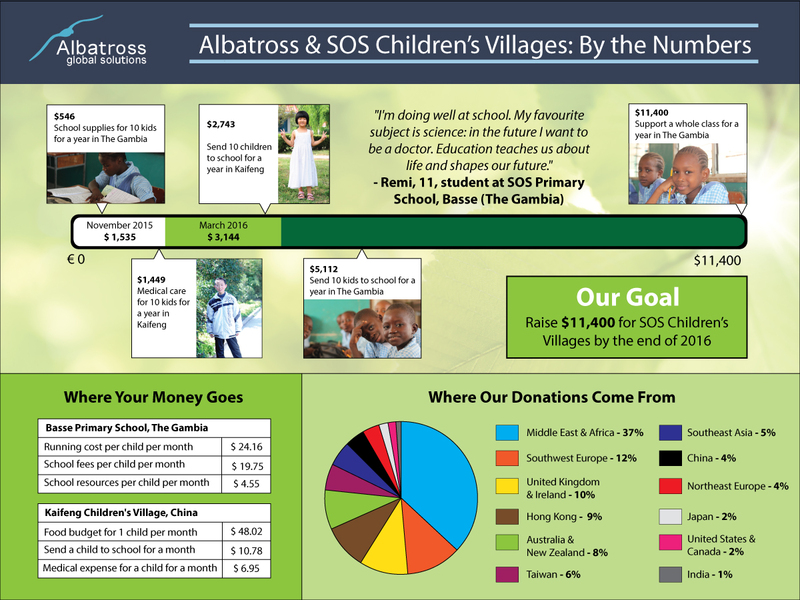 Thanks to the generous contributions of our Evaluators and employees, Albatross Global Solutions is pleased to announce that we have now officially contributed $3,144 to the SOS Children’s Villages in Kaifeng, China and Basse, The Gambia! That is already enough to have made a big difference in the lives of some of the world’s most underprivileged children. Because of us, children in Basse and Kaifeng are already able to get much-needed school supplies and medical care. But we know we can do better, which is why we’ve set ourselves an ambitious stretch goal: not only providing school supplies, medical care, and school fees, but raising enough money to provide for a whole class for a year in The Gambia. Funding a whole classroom means providing the “full package” of education to the children of Basse: teachers, textbooks, extracurricular activities, everything that those of us who were privileged to be born into safety and security took for granted in our schools. When children lose the care of their parents, or come from families struggling with disease, war, or poverty, education is often one of the first things they lose, and with it, they lose the best opportunity they have to build a brighter future for themselves and their communities. Albatross is helping SOS Children’s Villages give them back that opportunity, and we hope you’ll consider doing so as well.